Three to five hours long depending on the project or the requirements of the group. 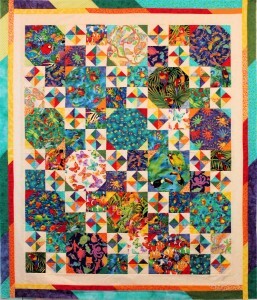 Available for all Gumbo Design Studios patterns plus the projects shown below. 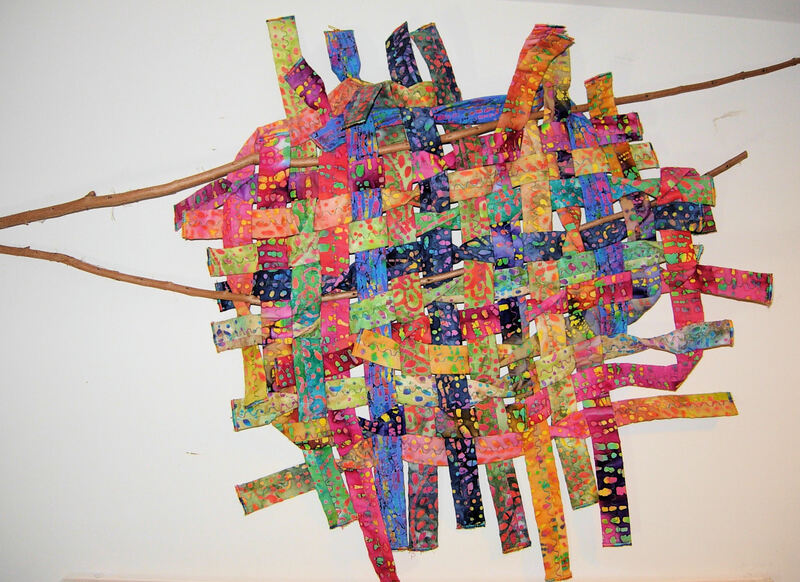 If you love drama and abstract art, and want to try a different design concept, this is the workshop for your group. 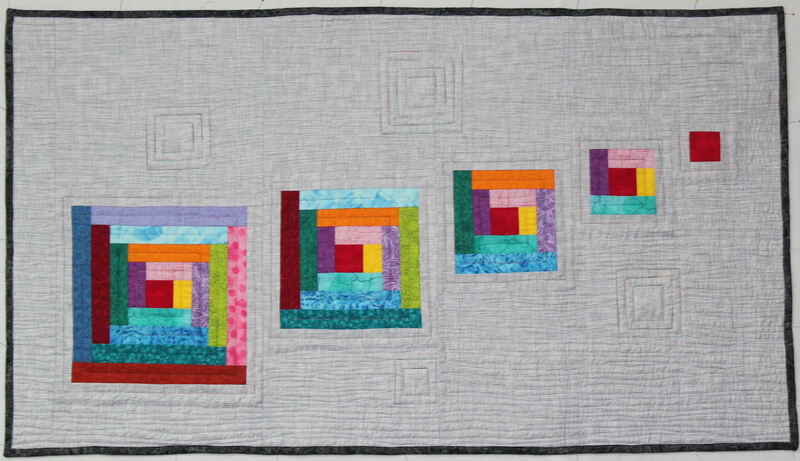 These modern mini quilt projects will introduce your group to the Modern Quilting style of design,quilting and finishing options. Approximately 24″x 36″each. 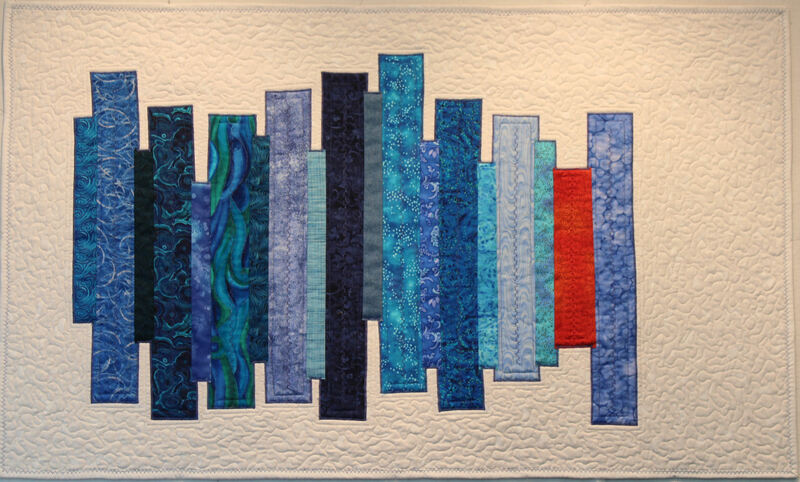 The workshop will begin with a short presentation on what the Modern Quilt movement is and how it is different from other quilting traditions. Each student will choose from one of the three project samples. Supply lists and images of the sample projects will be available in time to be presented to the members at least a month prior to the workshop. Choose one or all three for your group. 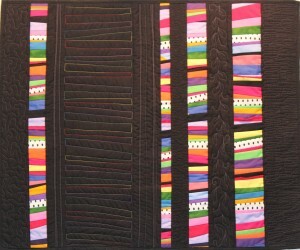 Join in the fun in the newest trend in the quilt industry. See if you might incorporate this type of design in your next project. Students may vary the size to suit their needs. Rippling Bayou Table Runner - Top your table with this festive unique table runner design. 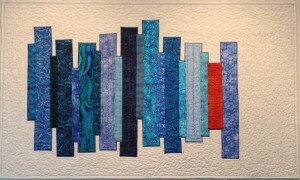 Sample is 17″x 47″. Each can be made to your desired dimensions. Quick construction. Learn to bind inner corners by machine. A great hostess gift! E-reader tote - Make a tote just to carry your Kindle,Nook or a book and magazine. Great for travel! 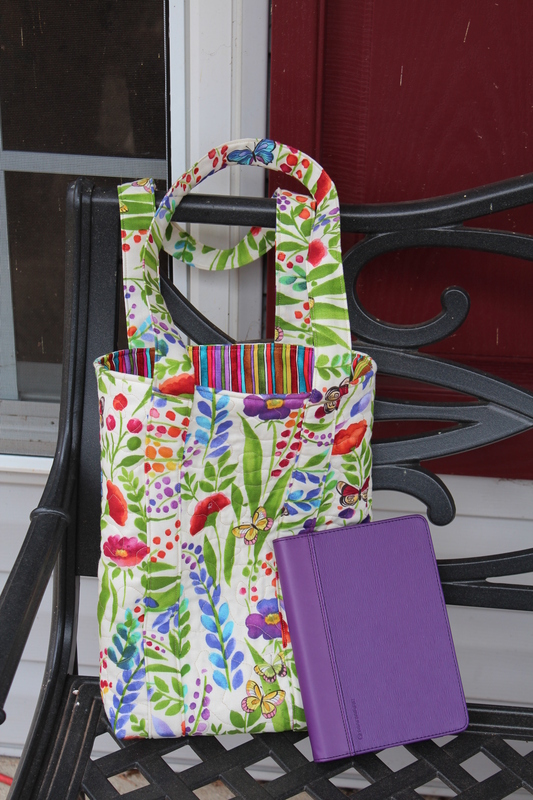 Bag is lined with two inside pockets and straps that fit over your shoulder. 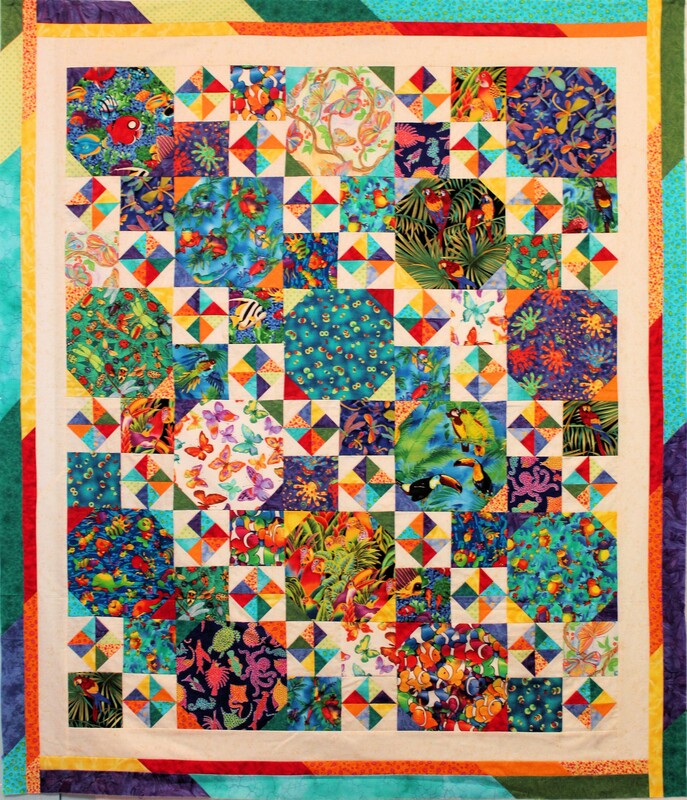 Summer Garden – 21” x 21”. 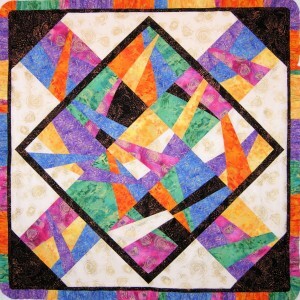 A bit of an art quilt class for non-art quilters. 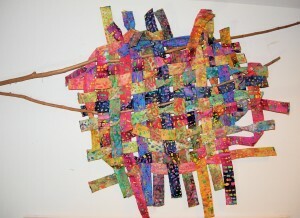 Fat quarters become a woven wall quilt where inspiration has some fun. Learn simple techniques for creating an “outside the basic quilt box”. Intermediate skill level. Fractured View – 24” x 30”. Learn to slash and insert strips to create a one-of-a-kind project. 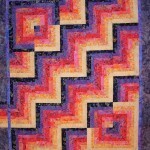 Use a simple pieced underlayment,then let the project develop. 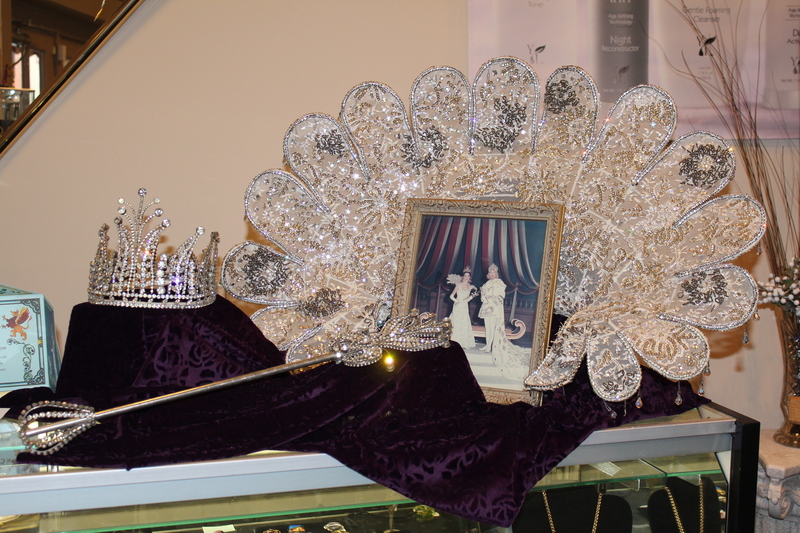 Add ribbon and bead embellishments for glitz. Intermediate skill level. 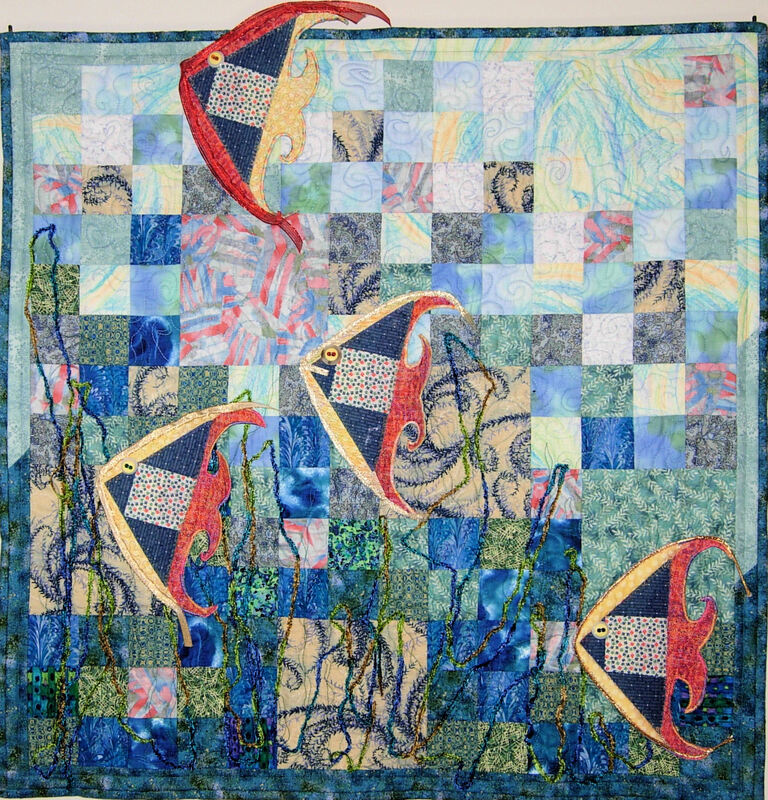 Heading Up Stream – 30” x 30”. 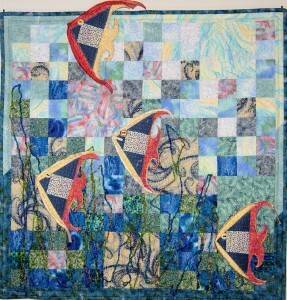 Turn a nine-patch block into a school of three-dimensional fish – each with its own personality. Intermediate/advanced skill level. 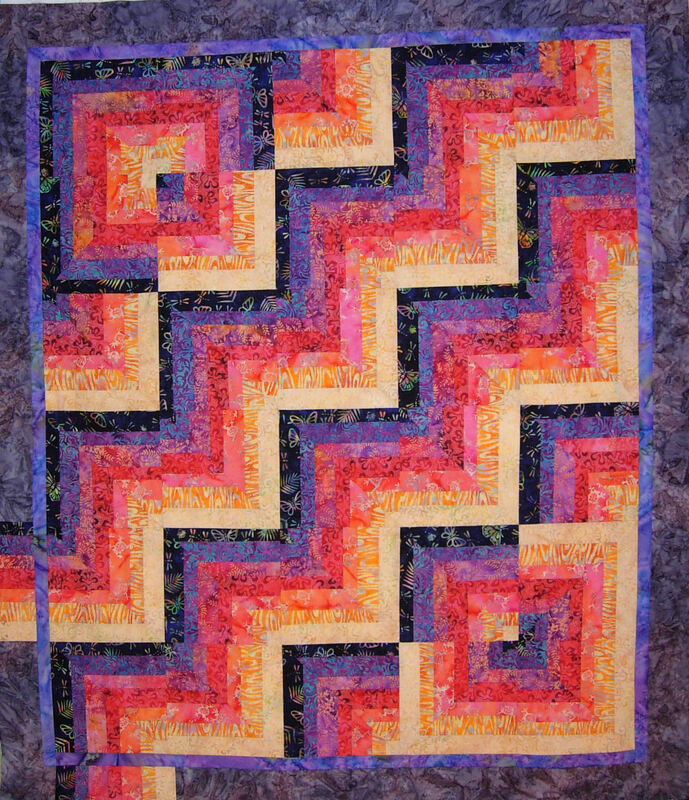 Bargello Delights – 25” x 31 ½”. 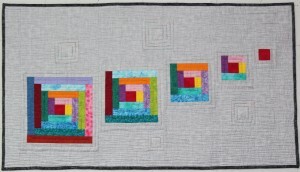 A technique workshop to give students the confidence and skills to create their own unique chevron-style wall quilt. Confident beginner skill level. 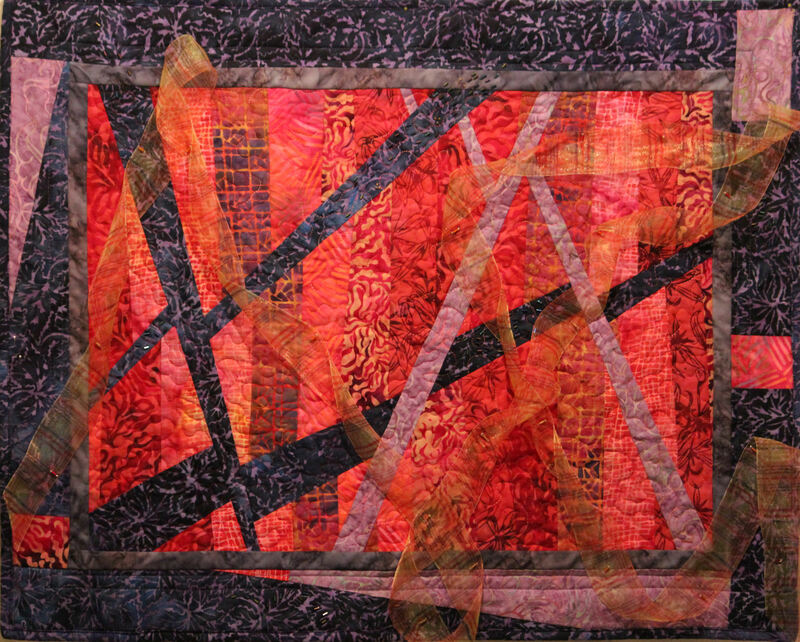 Summer Heat – 40 ½” x 50 ½”. Made from a collection of 1 ½” strips, this lap quilt is fast and fun. Careful placement of light, medium and dark value strips gives the design movement. Beginner skill level. Gone Wild – 41″x 41″. 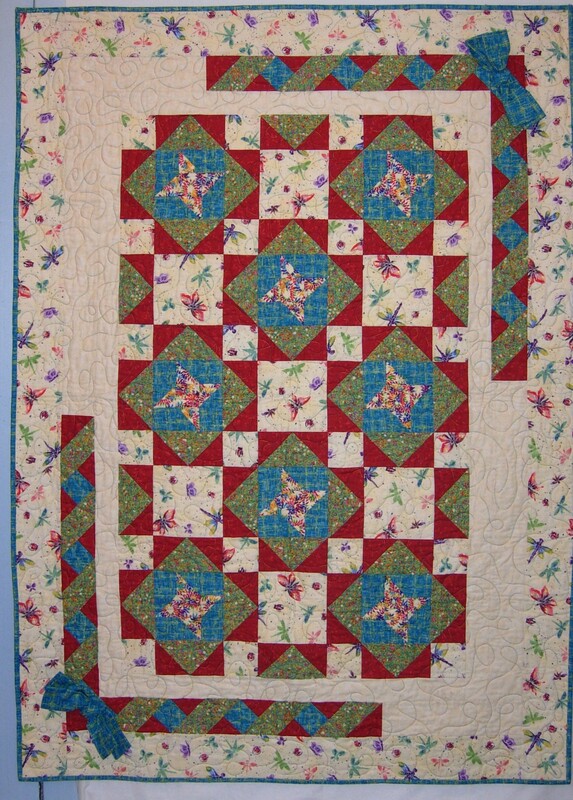 Table topper with ruffled edging. Slash and insertion technique with floating effect setting. Intermediate skill level. 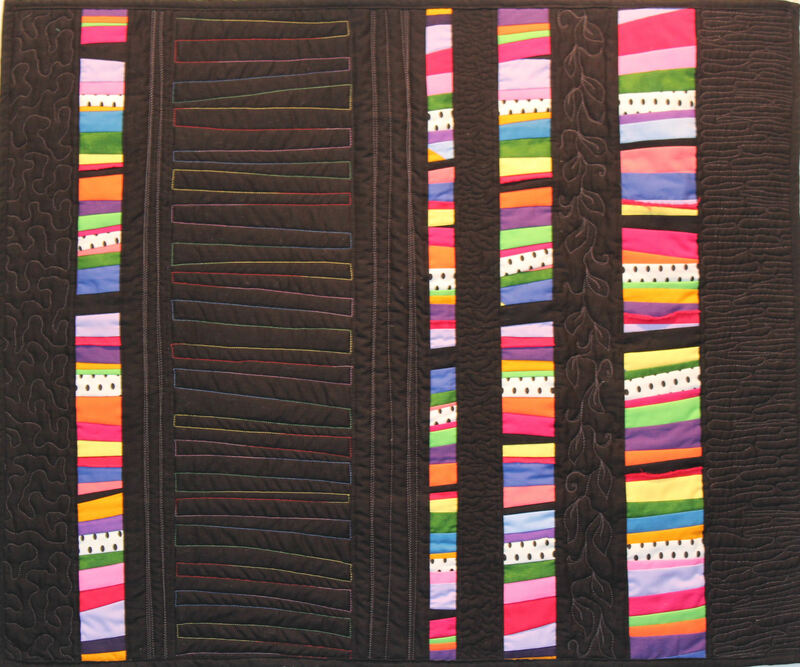 Tied with a Bow - 47 1/2″x 66″. 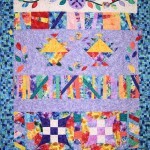 Combining Friendship star blocks, flying geese and solid squares, this quilt looks more complicated than it really is. 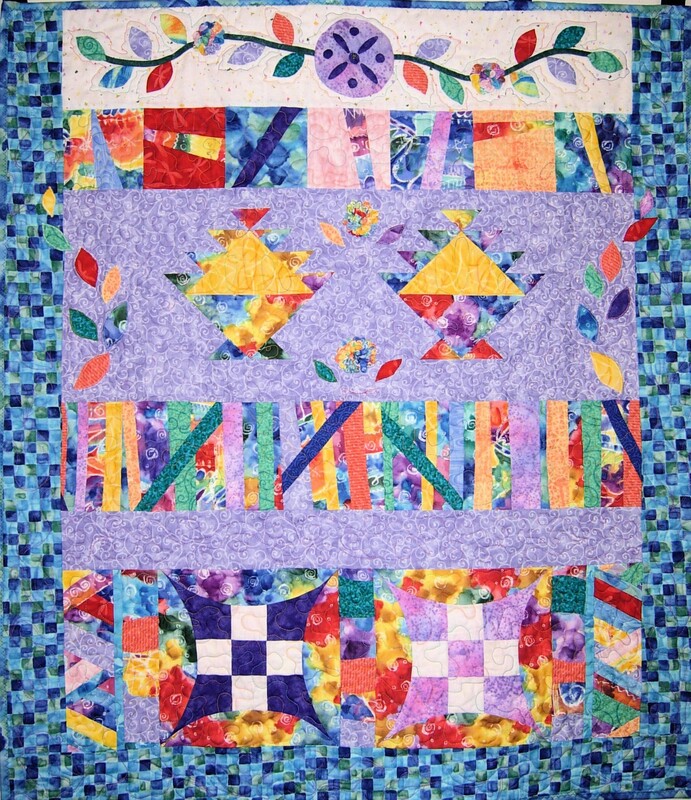 Opposite corners are defined with ribbon units and a 3-D bow. Beginner skill level. 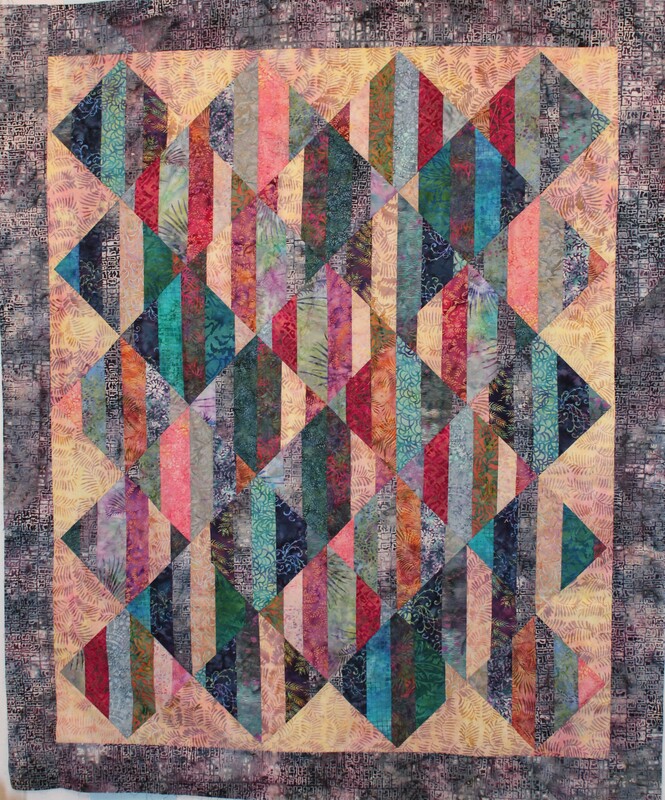 Everything Under the Sun - 50 1/2″x 58″. 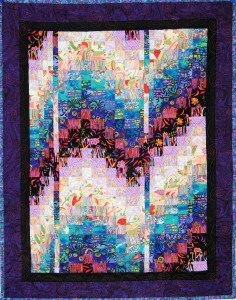 A great design for using up theme fabric. Sample is filled with children’s animal prints in bright colors. Any theme works well:holiday, florals or a colorway (just blues and greens). 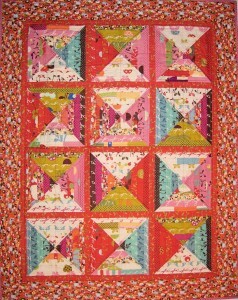 Small double pin wheel blocks pick up the colors from the large block fabrics. Beginner to advanced skill level. 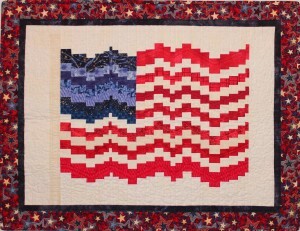 Grand Old Flag – 35 1/2″x 27″. Imagine a patriotic flag flying up on your wall. Bring out your red,white and blues to create you own Bargello masterpiece. Students see immediate results from this spirited class. 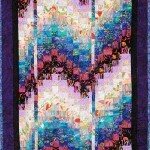 Look at the Store page under Patterns and Home Dec to see the images and descriptions for these designs. Fees for workshops and presentations are available upon request.